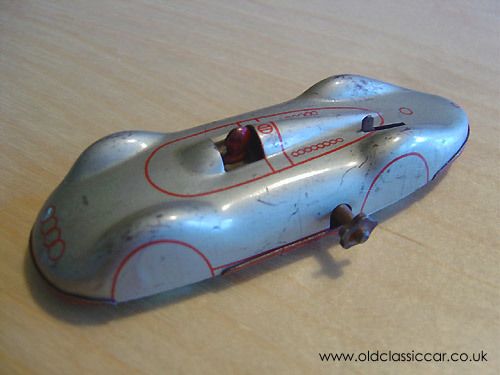 Made in Germany and probably dating to the late 1930s is this compact toy Auto Union. There is no maker's mark on it unfortunately. The styling is similar to that of the famous Land Speed Record cars that were run on the autobahns of Germany immediately prior to WW2. The separate little pressed tin driver is still in place, as is the (fixed) little winder knob. The clockwork motor in this car works fine, and overall the condition of this tinplate toy is very good really.